DON’T FORGET TO COMPLETE YOUR CPD REQUIREMENTS BEFORE THE 31ST MARCH. TAKE THE EASY PATH TO CPD COMPLIANCE WITH IN2AP LEARNING’S USER FRIENDLY ONLINE PLATFORM. 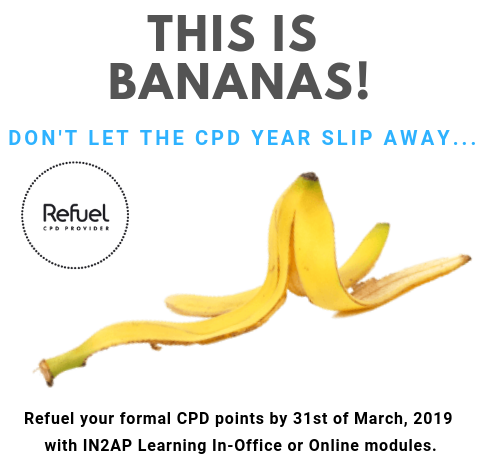 The end of another CPD year is fast approaching, so it’s timely that you and your colleagues are up-to-date with your CPD requirements. 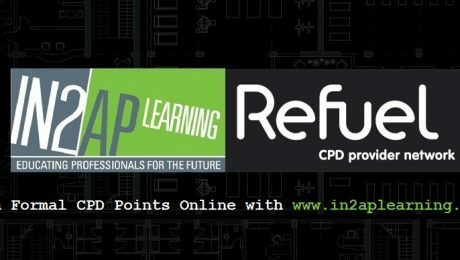 IN2AP Learning’s online learning platform is a leading Australian platform for Architects to earn formal CPD points. It allows you to update your skills, claim continuing professional development (CPD) hours and points and assists you with understanding the latest developments in products and any regulatory changes. At IN2AP Learning we pride ourselves on developing and presenting quality CPD activities. As such, our educational modules are reviewed and endorsed under the Australian Institute of Architects Refuel banner. Refuel is the Australian Institute of Architects brand for continuing professional development. Refuel was launched in 2005 and is recognised nationally by members of ‘The Institute’ as providing quality CPD. Moreover, our modules are reviewed by a surveyor. By achieving high level accreditation, you can be sure that quality and relevant information is presented. The range of online courses provides you with the opportunity to learn from home, or on the move, at a time that suits you. IN2AP Learning’s Online Learning gives you access to learning material that suits your interests and allows you to share your knowledge with others. Our online CPD modules offer an engaging an educational experience which combines text, images, short videos, interviews, a question and answer forum and other such interactions. Our format makes our presentations enjoyable and therefore enables you to retain more information. In addition, all of our online modules are reviewed and amended to ensure that information is current and correct. At IN2AP Learning, we offer CPD online modules that cover all of the core competency areas. Choose one, two, three or more modules depending on your requirements. It is important to us that our CPD are easily accessible from any internet connected mobile device as well as ensuring accessibility to Architects and Designers in rural areas. At IN2AP Learning, we have developed educational programs that are suited to the architectural profession. 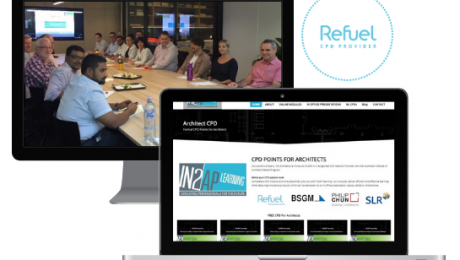 When you participate in one of our modules, whether online or in-office, you will accrue formal CPD points which have been recognised by the Australian Institute of Architects Refuel Program. We pride ourselves on providing an in-depth, engaging learning experience which extends the focus of one particular area (or product) to a complete solution without the parochial mentality. End of Another CPD Year! 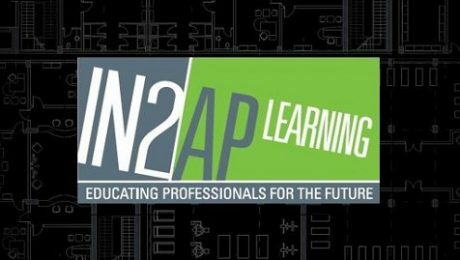 Why Do Our Leading Architects and Designers Nationwide Choose IN2AP Learning CPDs? At IN2AP Learning we believe that the best way to answer this question is; because we are able to offer a complete service with expertise. Research and development of learning modules. We manage the accreditation process and are therefore endorsed as a Refuel CPD provider by The Australian Institute of Architects. Our learning platform IN2AP Learning Website has become an industry ‘go to resource for CPD modules. 19 years of industry knowledge, relationship building, a comprehensive database, and trust in our business and quality CPD module are the absolute preconditions for a good working relationship. We therefore, without a doubt, have the capacity to secure presentation bookings. In other words, we are involved in the entire cycle. A service supplier that includes in its offer all of these activities in not particularly easy to find…a single point of contact to manage the entire process from concept stage to the complete CPD module, presentation, management, client liason and beyond with expertise is what we do and what we are good at. It is no surprise that our clientele choose IN2AP Learning CPD modules as they have full confidence in our educational ability, current and in depth industry and product knowledge and as progressive thinkers we all about educating and challenging thoughts and antiquated approaches. 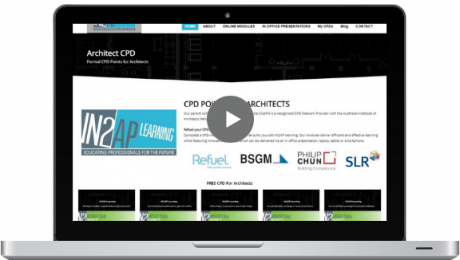 IN2AP Learning has a range of formal CPD modules to suit our specifiers. 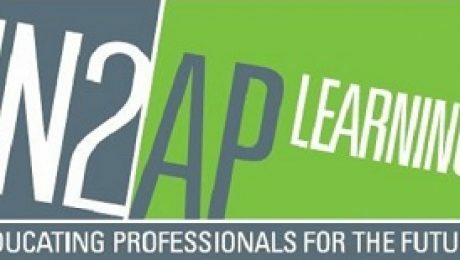 Did you know that you can fulfill all of your formal CPD requirements online with IN2AP Learning’s online platform? 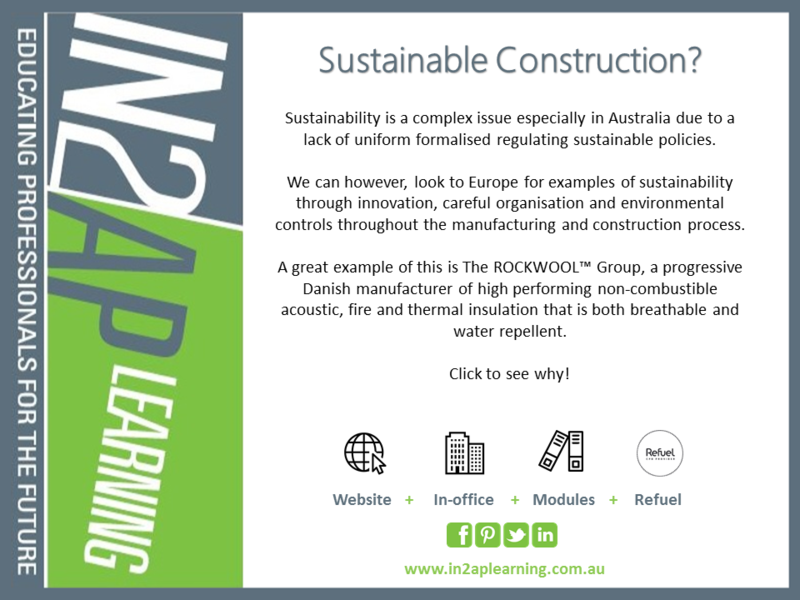 IN2AP Learning’s Online Learning is a leading Australian platform for Architects to earn formal CPD. It allows you to update your skills, claim Continuing Professional Development (CPD) hours and points and assists you with understanding the latest developments in products and any regulatory changes. The range of online courses provides you with the opportunity to learn from home, or on the move, at a time that suits you. IN2AP Learning’s Online Learning Platform gives you access to learning material that suits your interests and allows you to share your knowledge with others. Select the module of your choice at anytime that suits your schedule – everything is available 24/7. All you need to do is register for a password. At IN2AP Learning, we offer CPD online modules that cover all of the core competency areas. Choose one or ten modules depending on your requirements. It is important to us that our CPD modules are easily accessible from any internet connected mobile device as well as ensuring accessibility to Architects in rural areas. A well thought out facility is one that balances the needs of the residents (and staff) whilst catering for the ‘whole person’. There is a vast body of knowledge that looks at the impact that the built environment has on the mental and physical health of the resident. 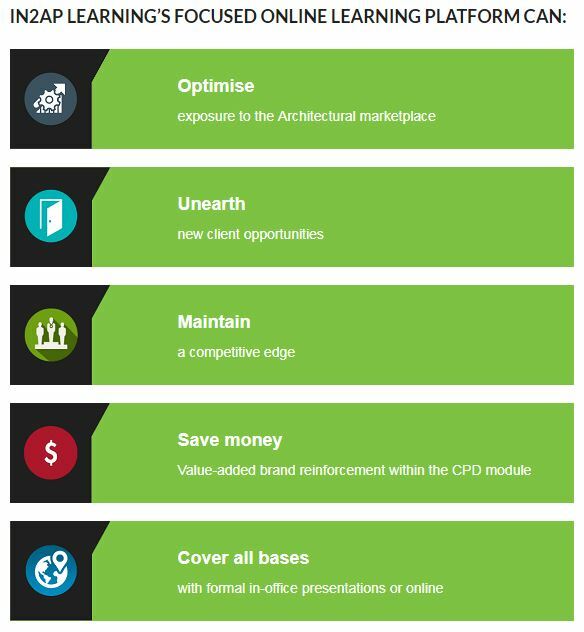 Best practice design involves rethinking ‘aged care facilities’. This can be achieved by moving away from antiquated ‘institutional’ models of design and construction, to a structure that emulates domestic design and character. The key here is to remember that the aged care facility is first and foremost a home. Careful consideration should be given to the occupants of the facility that one is designing for. This is perhaps even more important when designing for the elderly and furthermore for dementia patients in aged care facilities. Conversations at the design table, are often focused on bed numbers and service provision rather than the broader vision or amenity of the residents. The challenge here is finding the balance between architecture and practicality. The ‘institutional look’ of aged care facilities is antiquated. 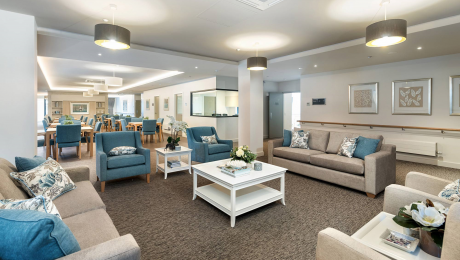 Moving forward, the design of aged care facilities should reflect warm and homely buildings, as austere and collective living environments have been shown to impact the personal identity of the residents and should be avoided. The design of urban centres need to change in order to encourage a more integrated way of living. 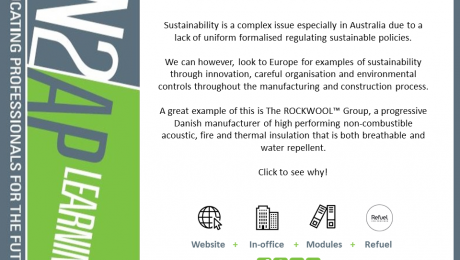 Utilise the interior fit out to support acoustic comfort. Providing a domestic ambience through colour selection is desirable. Choosing the correct colour palette directly impacts on how people feel and thus impacts their moods. According to Dr Zena O’Conner PhD, with reference to the interface between colour and human response “Colour and contrast together can play key roles in encouraging engagement, supporting orientation and way-finding, and through colour differentiation provides a safer environment for everyday activities.” (Reference-http://dementiadynamics.com/category/alzheimers-and-dementia/page/6/.) ‘Colour Psychology’ as a concept is nothing new. With each colour in the spectrum having a different significance, it is important to look at the effect that each colour has on mood, behaviour, and the overall emotional well-being of residents. As deteriorating eyesight is commonplace, it should also be given due consideration when considering colour selection. Declining vision can cause the contrast between colours to be less noticeable which may also result in changing depth perception. This is why high contrast colours may assist in helping residents to define objects and levels. Colour and depth perception become greater issues when designing spaces particularly for dementia patients. Creating a built environment that accommodates people with dementia is one of the greatest challenges faced today by the building and design industries. Dementia has become a major health priority, with more than 50% of aged care residents living with dementia. Yet understanding the condition’s best management practises is still relatively new in clinical terms. One of the key ways to render an aged care facility as ‘dementia friendly’ is to provide a space that has distinctive environmental cues. As people with dementia experience memory loss and disorientation, it is important to “highlight the purpose of different spaces and location of items.” (Alzheimer’s Care Quarterly, J. Nagy). For all practical purposes, colour should define spaces, and also create a sense of ‘familiarity’ within the space. In order to assist residents to overcome disorientation more easily, allowing them to regain their autonomy and independence, it is best practice to paint different areas with distinct colours. Colour and pattern must also be carefully considered when exploring flooring choices. Particular attention should be given to pattern as residents with dementia often perceive patterns and motifs as actual objects. For example, a carpet with a pattern of white specks on a dark background may be distracting to a person with dementia. They may perceive the specks to be bits of tissue and therefore try to ‘pick’ them up off the carpet. This also applies to strong contrasting bold and prominent patterns including patterns with large motifs and/or small patterns which are also to be avoided. Therefore, patterned floors should be avoided, as should sparkly floors as they may be perceived as a wet surface (slip risk). Logos or brands may also be perceived as an obstacle. Stay away from any flooring with a high gloss or shiny finish which may also be viewed as a slippery surface. Aluminium, brass or any such reflective trims or transitions are also a hazard as they often result in ‘high stepping’. Ultimately, the goal is to design an aged care facility which enables the physical environment to compensate for the sensorial and perceptual deficits of residents and should be regarded as a therapeutic goal. As such, a well-designed space should be achieved. When planning your kitchen form and function are equally important elements. Storage is paramount in designing a functioning kitchen. Zoning areas enables users and tasks to be separated in the kitchen space. Easy access, logical locations and thoughtful storage of items relative to task are key considerations. The elegance of a kitchen can be negatively influenced by poor functionality. Instead of being neat and organised, it becomes chaotic and messy. Once thought has been placed on where items are required relative to key activity functions, the right hardware needs to be chosen to compliment the design principles. Grass drawer slides are available in 40 & 70kg weight capacities. Understanding where your heavier items will be located will enable you to choose the right capacity for the right location. New technologies have seen the range of side decors (the double wall drawer bit) increase in size, which adds so much to use and functionality. 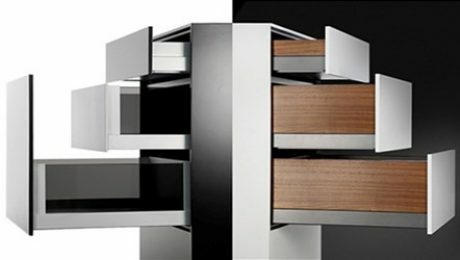 Drawer heights start from 63mm and go all the way up to 250mm. The range of applications is endless. 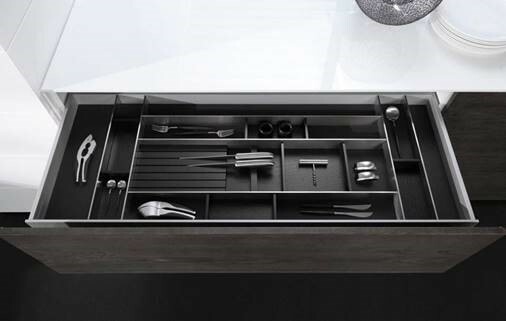 Look no further than the Nova Pro Scala drawer system to experience the finest quality in movement and performance. This is the most complete drawer range on the Australian market at this point in time. The level of stress is organised and categorised into colours. Red equating to severe stress on the body, Orange symbolising severe stress on the body, Yellow signifies light stress and Blue shows no stress on the body. When looking at the image, it is easy to see how the red and orange models demonstrate the postural stress involved when items are being retrieved from the base cabinet. The yellow ergonomics model shows the user accessing a full extension shows significantly better posture and the maximum level of stress on the body is still minimal and in the yellow zone despite items being on the bottom drawer. By utilising drawers and/or roll outs rather than shelves, a natural lifting posture is used. The challenge is to find the balance between architecture and practicality, the design of aged care facilities should reflect warm and homely buildings, as austere and collective living environments have been shown to impact the personal identity of the residents and should be avoided. Colour and pattern should also be carefully considered when exploring flooring choices. Particular attention should be given to pattern as residents with dementia often perceive patterns and motifs as actual objects. For example, a carpet with a pattern of white specks on a dark background may be distracting to a person with dementia. They may perceive the specks to be bits of tissue and therefore try to ‘pick’ them up off the carpet. This also applies to strong contrasting bold and prominent patterns including patterns with large motifs and/or small patterns which are also to be avoided. Flexible design due to operational changes, indicates that the average cycles of change in aged care is 5 years due to government policy, management and changes in the market. Flexible design should address future trends and changes in patient profile, that is, meeting the increasing demands on space and facilities because of increased patient numbers and in bariatric patients. Allowing for changes to two spaces such as interlocking rooms, for example enabling residents and couples to share spaces, with the flexibility that when the division of space is no longer required it can be reconfigured accordingly. By using continuous mechanical seals that exert an even upward and downward force for the life of the panel whilst compressing the carpet. A private space, waiting room, meeting area or consultation space can be created immediately.